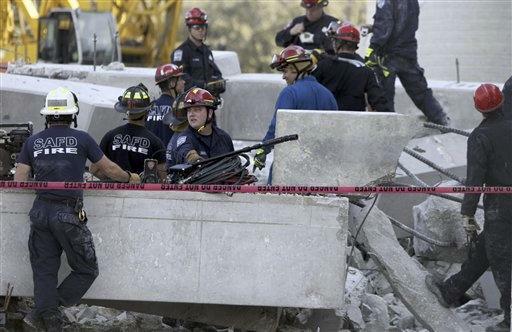 SAN ANTONIO (AP) - A 10-story parking garage under construction in San Antonio has partially collapsed, injuring two people, including one listed in critical condition. Authorities said Monday that more than 100 workers rushed out the garage at University Hospital when some of them heard rumbling. San Antonio fire department chief Charles Hood said an alarm was triggered that alerted crew members before portions of the structure began falling. University hospital spokeswoman Julie Wiley said one worker was in critical condition and another was in stable. She did not know how they were injured. The cause of the collapse was not immediately known. It left large piles of twisted metal and chunks of concrete at the busy medical campus on the city's northwest side.